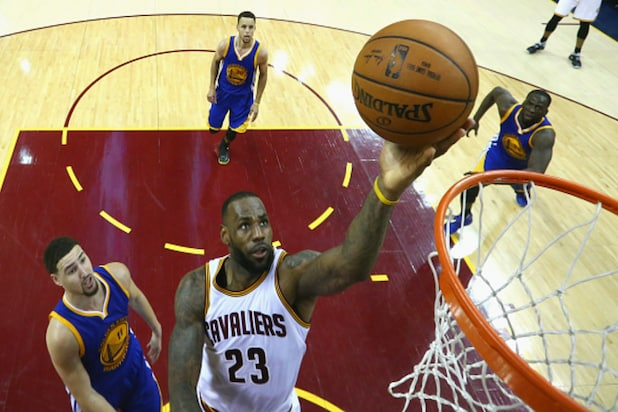 NBA Finals: Can Cavs-Warriors 'Three-Match' Top Last Year's Record Ratings? LeBron James restored glory to Titletown, USA, last year, when the Cleveland Cavaliers upset the favored Golden State Warriors in the 2016 NBA Finals. In doing so, the Cavs also enacted revenge, as the ballers from the Bay Area beat them for the Larry O’Brien Trophy a year earlier. Tonight, a “three-match” tips off, as the two dominant pro-hoops squads do battle in a best-of-seven championship series yet again. No matter who hoists the hardware in the end, there will be one clear winner: ABC. But can the struggling broadcaster come anywhere near last year’s huge Nielsen TV ratings? In a phrase, probably not — but here’s hoping. After all, this is Disney we’re talking about, and you can never discount magic. That’s exactly what the 2017 NBA Finals had going for them. The showdown went the full seven games, which is really the most important ingredient to the host network getting a smash hit. Those extra contests are worth even more than better media markets would be, which is something ESPN’s sister network found out about last year. After all, while San Francisco-Oakland-San Jose is the sixth-largest market in America, Cleveland-Akron is down at No. 19. In other words, in terms of potential tune-in, the last three years hasn’t exactly been Lakers-Knicks — but you won’t hear advertisers complaining. Plus, a long series breeds more interest from casual fans, the kind that are more interested in witnessing history and keeping up at the water-cooler than they are invested in the actual outcome of a few games. Last year’s Game 7 hauled in 30.799 million total viewers, the most ever for a basketball game on ABC. Counting all networks, that was the largest overall audience since Game 6 of the 1998 NBA Finals, way back when Michael Jordan retired from the Chicago Bulls. He’d come back after trying his swing at baseball, but never wear red again. All-told, the 2016 Finals on ABC averaged 20.166 million total viewers, making them the most-watched National Basketball Association championship series since that same Jordan triumph. One No. 23 keeping up with another. But the big question on Thursday is whether or not history can repeat itself, from a standpoint of both game quality and quantity. 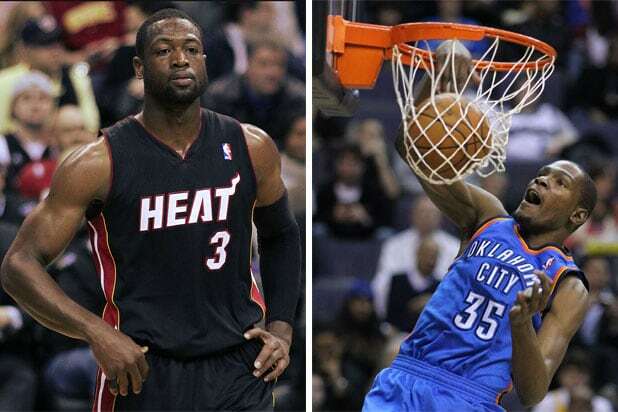 If the NBA’s two top teams prove to be as evenly matched as last year, then maybe. Even 2015’s performance would put smiles on the faces of ABC executives — that initial modern-day Cavs-Warriors match-up was the second most-watched NBA Finals on ABC. Not bad. The problem this year is that new Warriors’ Kevin Durant could single handedly make this a five or six-game series, as opposed to seven. His inclusion — along with very different regular season records between the two teams — explains why Golden State is currently favored over the defending champs. They’ve also got home-court advantage. The Cavs? Well, they’ve still got King James. And right now, he’s angry. Admittedly, last year had a little more oomph than this current one. After all, Cleveland hadn’t won a professional sports championship in 52 years, and prodigal son James had yet to make good on that big promise. Plus, Golden State had set a regular season record with 73 wins, besting Jordan’s 1995-96 Bulls and setting up a David vs. Goliath-style scenario — one that ended up with a Biblical payoff. To steal a final reference from the good book, we’ll find out soon enough if viewership for this year’s NBA Finals will fill up an entire ark, or simply a (last) supper table. The 2017 NBA Finals tip off tonight at 9 p.m. ET/6 p.m. PT on ABC.